Three and a half years ago, CCC demonstrated a prototype of claims artificial intelligence to insurers, and “not one” carrier that product management Senior Vice President Jason Verlen spoke to showed any interest. 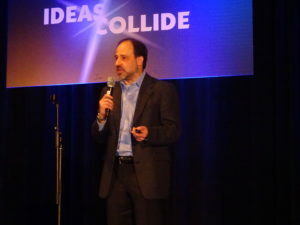 “What a difference three years makes,” he told the inaugural Society of Collision Repair Specialists IDEAS Collide audience Nov. 2 at SEMA. Today, there’s not a conversation between CCC and insurers where A.I. isn’t “the No. 1 topic,” Verlen said. Carriers are now calling CCC and wondering when claims A.I. technology will be ready. “Insurance companies are now all in,” he said. He said they were “going nuts” with claims-related A.I. Humans don’t learn like that, but computers do, and if you have enough data for an A.I. to digest, “it learns with devastating accuracy,” Verlen said. IBM, where Verlen ran predictive analytics prior to joining CCC, has honed its Watson A.I. to the point that it can recognize cancer from MRIs as well as or better than a human, according to Verlen. CCC has a data set of more than 200 million claims, and many of those include photos of the unfortunate vehicles. This allows it to give a computer millions of lessons in what a particular pattern of damage seen in a photo translates to on an estimate. Verlen in November described multiple use cases for artificial intelligence in claims, including the new Smart Estimate product CCC announced as “in-production” on Monday. “Everything exists right now,” he said. Collision repairers will need to understand that insurers will be handling claims using such tech. But they also should be aware about how such A.I. could be used for the body shop’s benefit. Want to convince a lower-tech insurer that a car’s a total before you start teardown? Plug a photo into Smart Total Loss. Want to use photo estimating as a consumer-convenience marketing opportunity and to triage customer demand? Use Damage Detection and Smart Estimate. Verlen said he had worked in the artificial intelligence field for 20 years, and once a tipping point is reached, it spreads “like wildfire.” You look back in 3-5 years and can’t believe you ever did it differently.